Jason Crane interviews trumpeter and vocalist Matt Shulman about his new album, So It Goes (Jaggo Records, 2007). Shulman sings and plays trumpet, but that’s where the Chet Baker comparison ends, although like Baker, Shulman incorporates the hip music of the day into his own work. Skilled at multiphonics — playing one note while simultaneously singing another — Shulman is able to expand the range of the trumpet beyond its normal capacity. 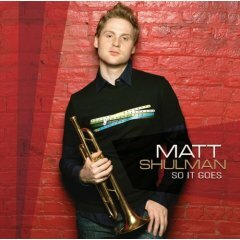 On So It Goes, Shulman tackles everything from Led Zeppelin to “My Funny Valentine” with impressive results.